Yesterday, I shared about Parker's cup o' caterpillars and our caterpillar study. After about a week as chrysalides, our caterpillars made their transformation into butterflies! Y'all, this was the neatest thing. They emerged very, very tired and in need of rest (I imagine that growing wings is quite taxing). 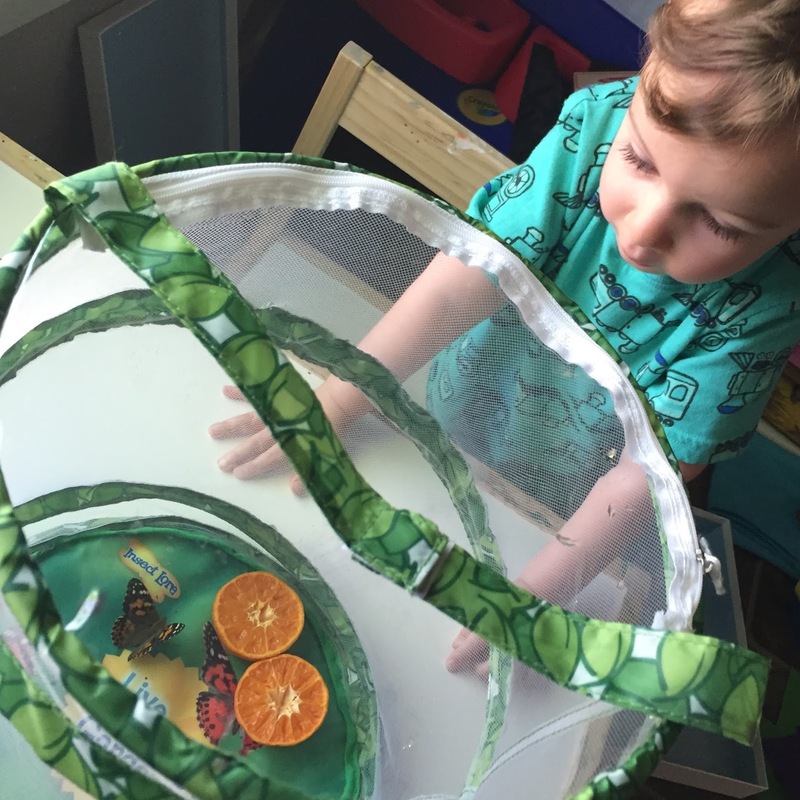 As per the instructions from Insect Lore, we added fruit to the butterfly habitat for a food source. 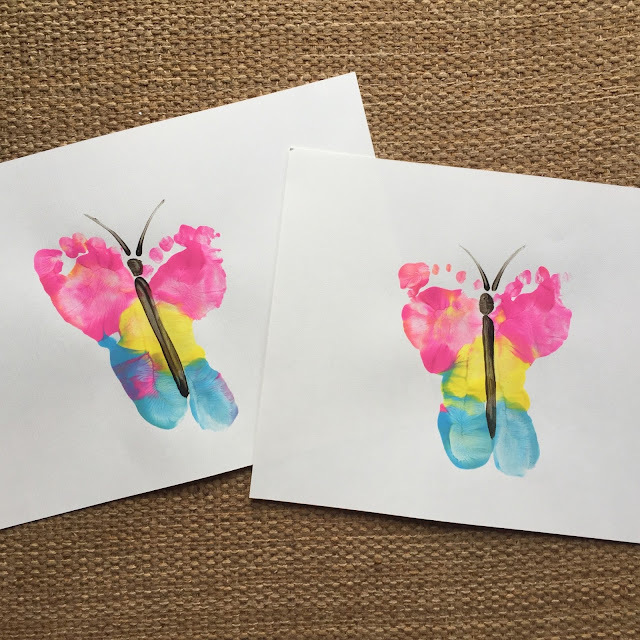 Our butterfly craft involved painting little man's feet - his favorite! I did one foot at a time, adding more paint after each foot stamp (we made several of these so we could send them out to family). Then, I cleaned up the first foot (using baby wipes) and repeated the same steps with the same colors on the other foot, making the other side of the butterfly. After they dried I added the body and antennae myself. 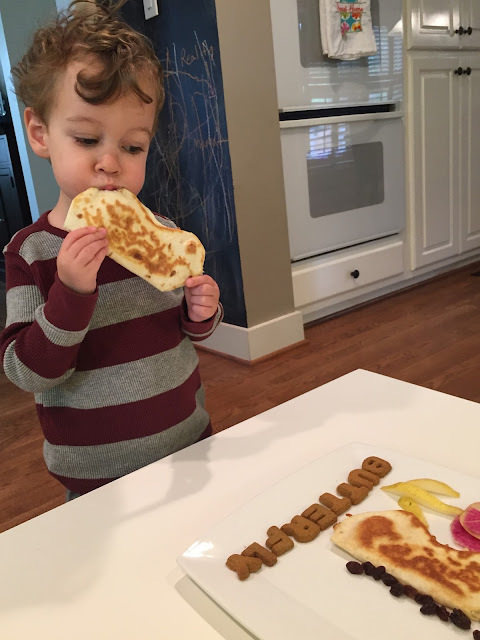 Lunch that day was butterfly-shaped quesadillas! I folded two tortillas and shaped the wings on each side with a knife before stuffing with cheese pocket-style, but you could also just do one big quesadilla. Pear and watermelon radish made up the flower, and I added Bitsy's Brainfood brand "Smart Cookies" to spell "Butterfly" (Parker is all kinds of obsessed with how words are spelled these days). All five of our caterpillars successfully transformed into butterflies. We have one more day with them, then they will be ready for the great big world! This is awesome! 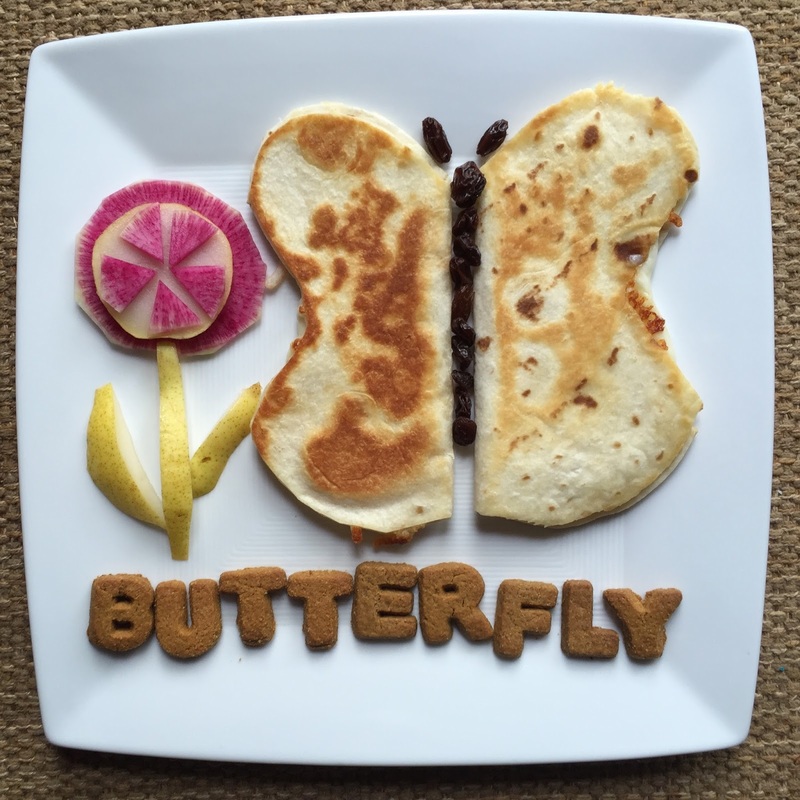 I love how you even incorporated butterflies into lunch. I remember being fascinated by butterflies as a little girl. You amaze me! I want you to be my little sister! That is so neat! I love the craft and the lunch is so creative too!